Why does the BioPatch exist? What is the BioPatch and how does it work? The BioPatch is our answer to the increasingly diverse and becoming smartphones and their different frequency ranges. It measures 30 x 40 mm and is 0.3 mm thick. It consists of 100% carbon and on one side there is a silver hologram foil. The information of the visible light spectrum is a vibrational spectrum of a higher order. An energy system, which is influenced by such an information, recognizes and accepts the vibration of the higher order and thus its impact on any living organism is made to be harmonic. A more detailed explanation can be found here. To the BioPatch we also added more information to support a positive attitude, without affecting the free will of man. A list of positive affirmations can be found here. Where is the BioPatch applied? Most smartphones can be opened. In such devices simply place the BioPatch under the battery in the vicinity of the contact between battery and the handset and replace the cover. 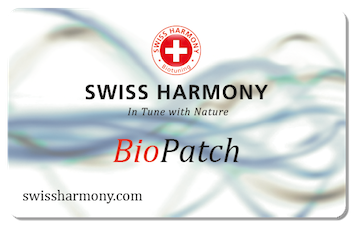 In smartphones, which no longer can be opened and have a back made of plastic, glass or ceramic, simply attach the BioPatch using the Hafty on the back, near the connector for the power supply. Smartphones with an aluminum back always have an area which is free from aluminum, because it is necessary for the reception and transmission of frequencies. Place the BioPatch on this area. It does not affect the function of your smartphone, but the BioPatch will have its full effect, even if it is only a small gap in the aluminium, as is the case with the iPhone 6 (6 Plus). For everyone who uses a protective cover, the BioPatch is thin enough to fit between the cell phone and the case with out a visible. Why should you avoid aluminium? Aluminium is one of the few materials that can shield many types of radiation and information. A cell phone that is wrapped in aluminum foil will have a tough time receiving any phone calls. Any steps taken to harmonize a telephone is therefore futile if the product is attached on aluminum. 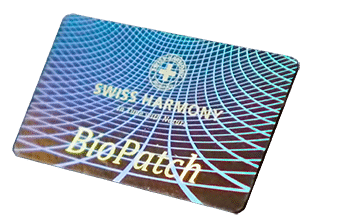 The Swiss Harmony Hafty is a self-adhesive membrane and is the ideal tool to fix the BioPatch in place, thus increasing its areas of application. Its surface is made of nano-suction cups that need to be kept clean for the full adhesive properties to be guaranteed. This is easily done by washing it briefly under cold water. The full suction is immediately restored when dried. The Hafty can be washed as many times as necessary. Where else can the BioPatch be used? 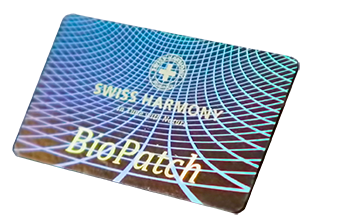 The BioPatch works just like the BodyCard, which is one of our best-selling products. In the trouser or shirt pocket it acts on the body’s energy system and aligns it harmoniously. Harmful effects of electromagnetic pollution remain ineffective as they cannot form resonances with the cell frequencies. If you don’t have any pockets, then with the help of the Hafty you can stick the BioPatch in a shoe. The best way is on the inside under the heel. The BioPatch is so thin that it is hardly noticeable. This application is especially useful for children. We know that some children have lost their BodyCards, BioRings or BioBracelets. Please only equip one shoe with the BioPatch! Placed under a drinking glass the BioPatch harmonizes the information of hazardous ingredients and can also lead to the drink tasting more intense. The same applies to food. Simply place the BioPatch underneath the plate. If your dog has a leather collar then the BioPatch can be stuck to the inside of it using the Hafty. Customers have told us that harmonized dogs are calmer and show more “personality”. 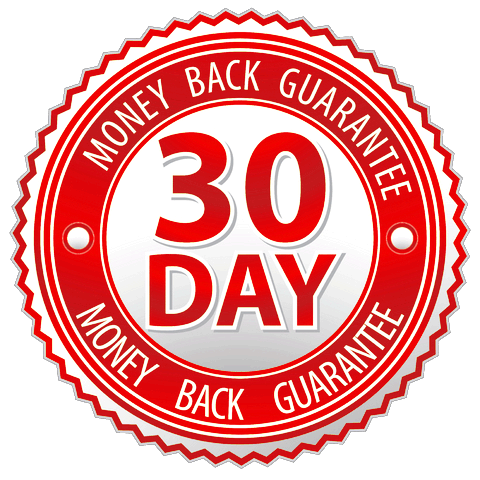 That makes sense, because dogs are – like us humans – known as radiation avoiders and are severely affected by all the fierce frequencies, especially those of cordless telephones (DECT) and the wireless network in your home. If these influences are harmonized and cannot affect the dog then they can “come to their senses”. The same applies to horses, which are highly sensitive radiation avoiders. Attached to the bridle, the BioPatch ensures a harmonic horse relieving it from the harmful electrosmog. The BioPatch shows off it versatility perfectly in the workplace. The classic application is to carry it in a trouser or shirt pocket, harmonising the energy system of the wearer. Although the Climate MiniTuner is the perfect solution for the workspace, the BioPatch can be used as a short term solution. Attach it directly to a power strip, which supplies all the devices in the workspace with electricity. In this case, the electromagnetic fields of the connected devices are harmonized. 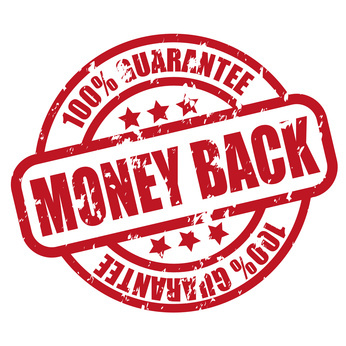 Worn on the body, an immediate relief is particularly noticeable to many highly sensitive people in vehicles of any kind. In hotels the best location to place the BioPatch using the Hafty is on the keycard slot near the room entrance. As this usually activated all the electricity for the room it is the perfect place to ensure a widespread harmonization, ensuring a restful sleep free from the negative effects of electrosmog.